Kenji Mizoguchi believed that Osaka Elegy, his 56th film,* marked his first serious work. "I was able finally to learn to show life as I see it," he said. With so little of the director's previous work available to compare it to, perhaps he is right, but the likelihood that he produced dozens of previous works before suddenly hitting artistic pay dirt engenders a certain amount of skepticism. It's hard to argue the results, however, as Osaka Elegy is so aesthetically sound and emotionally draining that, whether it marks the director's arrival or not, certainly stands as the work of a master. Opening with a flourish of big band music that will sound all to bitterly ironic in the moments to come, Osaka Elegy initially catches the audience off-guard before moving in for the kill. Its first shot depicts blazing neon signs on Japanese buildings, a vision of modernity as Japan moves further into the contemporary era. But Mizoguchi holds the shot as the sun rises, switching off those burning lights and leaving an ugly, uninteresting shell. In its first moments, it suggests that Japan is moving in the right direction, yet the sunrise yields an image points toward Mizoguchi's concerns with the rest of the film. In the full daylight, the skyline becomes nondescript, even a bit old-fashioned. From that moment, the director dives into Japanese life to find that, despite the nation's modernization, its citizens still conform to outdated, practically feudal social stratification. Chief among its second-class citizens are women, a group of whom bustle in the mansion of a rich man, Mr. Asai, who speaks the first lines of the film. Those lines are an insult to one of his female servants, chastising her for giving him a towel that wasn't completely dry. He spends the rest of his morning berating the young woman as she prepares his meal and puts on his vest and coat, even going so far as to suggest she'll never nab a husband through her incompetence and simplicity. The woman is not the film's protagonist, and Asai will only play a small (but highly significant) role in the narrative, yet Mizoguchi starts here to show how ingrained attitudes against women are in society: all the woman can do is apologize for the flaws the man incessantly points out to her. 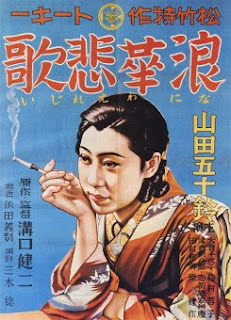 This opening aside reveals the entrenched norms of Japanese society so that when Mizoguchi introduces the protagonist, telephone operator Ayako (Isuzu Yamada in a fiery yet heartbreaking performance), her modern profession immediately establishes itself an inadequate defense against the traditions that will eventually crush her. She works at Mr. Asai's pharmaceutical company, and the boss openly makes a pass at her behind the obscure glass door of his office. The image of that closed door is a recurring shot in the film's first segment, demarcating the "proper" social behavior in the rest of the building and the lewd soliciting found within. Asai Pharmaceuticals thus becomes a symbol for the rest of the film, and the contradictions in the Japanese sense of propriety and honor. Ayako does not respond to her boss' advances, but she finds herself going home with Asai when her father reveals that he's plunged the family in debt and embezzled ¥300 from his own employer. With her self-absorbed student brother unable (or unwilling) to cover for his dad, Ayako agrees to sleep with Asai to settle her father's debt. Mizoguchi's eye is merciless as it captures Ayako's increasingly hopeless existence. She receives the money from Asai, and accompanies him to the theater, where Asai's wife catches the two. Considering that her modernity drove Asai to look for more submissive companionship, it's not surprising that Asai's wife refuses to simply let the incident slide to avoid making a scene, but Asai's colleagues gather to cover for their friend. One of the co-workers, Mr. Fujino, mediates the situation by assuring the wife that Ayako was his date, not Asai's, and the men fall in line immediately, embarrassing the woman for being so flighty as to assume the worst of her noble husband. Later, Fujino takes the young woman as his own mistress, to which Ayako acquiesces in order to pay her brother's tuition fees. It is at this point that it simply becomes impossible to discuss Osaka Elegy without comparing it to the director's own life. Mizoguchi's father sent his family plunging into debt with some bad investments, and times turned so desperate that the family sold Mizoguchi's sister as a geisha. She helped keep the family afloat, and it was only through her marriage to a wealthy patron that the director could attend art college. Ayako's actions, and Mizoguchi's sister's, reflect the Japanese tradition of giri, of social obligation and duty. A major aspect of giri concerns filial piety, devotion of children to their parents and the need for the children to tend to their elders when needed. The fate of the director's sister would not seem so unorthodox even in the early 20th century, and Ayako's descent into prostitution becomes an inevitability as she struggles to pay back a socially conceived debt to her parents that she, like every child, can never fully repay. Mizoguchi doesn't buy it, however, just as he never forgot how much he owed to his sister and how much he hated his father for abusing her and his mother. He takes giri to its most disturbing extreme, in the process highlighting the hypocrisy of the demand for honor men place upon the women and the salacious lusts they want to sate. This social attack is communicated as much through aesthetic as it is the narrative. Mizoguchi's deep focus photography is excellent, yet he uses the device less often than the other major deep focus directors of the time, Renoir and Welles. Mizoguchi uses long takes and deep focus in the style André Bazin preferred, that which left the audience to decide what was worth its attention instead of forcing them to focus on the images the director felt were important via montage. However, he also moves between deep and shallow focus in his shots to let us know whether anything in the background is worth seeing. If something important is happening, Mizoguchi uses the deep focus and allows the audience to peer past the foreground; if there isn't, then he doesn't try to lure the audience away from what matters. Married to immaculate staging, the stellar photography captures images that suggest themes without a word. The women in the frame often kneel before the men, showing how women must still literally place themselves below the males in society. Yet Mizoguchi subverts the image, lighting the women as he usually casts the men in shadow, stressing their sinister control even as he suggests with darkness that the men are just weaklings. When Ayako's would-be suitor, Nishimura, visits her home, he casts a long shadow on the sliding paper door; unlike the looming presence this normally affords a character, however, this shadow makes the man look small, insignificant, piercing the heart of the man long before his true nature is revealed. Even the city's architecture plays into Mizoguchi's critique: he captures the more reflective objects in the film -- metal, glasses -- in flares that give the movie an Art Deco leaning, a contemporary aesthetic that clashes with the traditional format of Japanese architecture. In doing so, the director reveals how antiquated those designs have become, and ties that back into the men, who sit inside their houses made of paper and flimsy wood as kings of their own domain. To Mizoguchi, they look scarcely more than petulant boys building a homemade fort with a "no girls" sign on it. It's all an illusion, he's saying, and one that requires so little effort to puncture though no one ever does. Ayako, whether she fully realizes it or not, attempts to shatter this illusion, buying makeup and hats and smoking cigarettes without a care for how she's viewed. Earlier, at the theater, we saw the female character in the play performed by a male-controlled puppet, and Ayako attempts to step outside this even as she turns to an occupation that relies entirely and openly on male dominance over women. Ironically, the punishment she receives for leaving traditional society is ostracism when a vengeful Fujino reports her to the authorities; faced with a tarted-up Ayako who represents the glaring contradiction between the ideals of propriety her father, brother and boyfriend place upon her and the effects of their lascivious tastes, the men abandon her. Thrown out on the streets where she was already making her new living. Osaka Elegy has its flaws: it's a bit on-the-nose, it could stand to spend more time than its spare 71 minutes further exploring its bountiful ideas and, gorgeous and meticulous as the aesthetic is, it wobbles uncertainly at times between the objectivity of its long takes and deep focus and a more sympathetic visual style (both perfectly valid, but sharply contrasting). Holding these quibbles against the film, however, seems a waste of time -- besides, criticizing it for not going far enough with its themes ignores the fact that Mizoguchi would re-examine them constantly for most of his career. In the end, all that's left is a reflection of those early neon signs, a sign that, through banishment, Ayako may more easily move into the modern Japan. She does so with such gusto that, as she walks toward the camera with conviction in the final shot, Mizoguchi pulls back, as if afraid. Hell hath no fury indeed. *At least I think it's his 56th. Even Mizoguchi didn't recall all of the films he made, and the vast majority of his silents and his early talkies were lost. I went by this list here.